Bar Harbor Inn & Spa in Bar Harbor, Maine. Spend the night in a lighthouse? Why not? How about in an 1870s guesthouse on an island ten miles out in the Atlantic? Or a century old cabin on a quiet pond, surrounded by nothing but woods and sky? These vacations are distinctly Maine. But this is only the beginning. This wildlife-rich, picturesque state offers an assortment of lodging options in its modern cities, upland forests and along the eye-popping coastline. You may have such a hard time deciding that you may end up staying at more than one. Would that really be so bad? Variety is, after all, the spice of life. Sometimes the line between hotels and motels is a fine one. Motels, or motor hotels, became popular with the development of the interstate highway system. By the 1960s motels were found along roadways from coast-to-coast. Depending on the property a motel may offer just a place to spend the night with convenient parking, or it may also offer a swimming pool, onsite restaurant and other services. Today Maine has several well known motel chains including Motel 6, Super 8 and Clarion along its highways, near airports and in towns. But there are also independent properties with quaint names such as Covered Bridge Motel or Bear’s Den Motel that pop up when you least expect it. Resorts offer a complete vacation experience. In Maine that experience could mean staying in pampered luxury at a high-end property that indulges your every whim. It could also mean a retreat to a scenic golf course where you may end up sharing the links with visiting deer or moose, or a woodland retreat on the shores of a remote lake. Some resorts offer vacation home rentals for long-term stays. 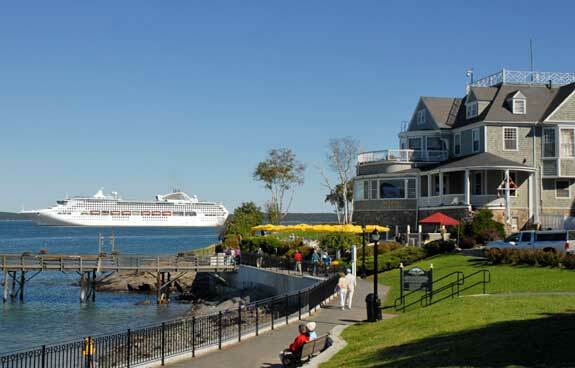 Maine offers beachfront resorts along its mid-coast, like in Boothbay Harbor, or in the Casco Bay area near Portland. In winter, guests flock to resorts in the Carrabassett Valley to ski on fresh powder. In summer that same destination is favored by golfers wanting to challenge one of the top rated courses in Maine and perhaps do a bit of fishing and hunting on the side. Maine has 542,629 acres of state and national parklands. It is little wonder that the state has an abundance of campgrounds. Some cater to tent campers; others offer services to those who prefer the RV lifestyle. Baxter State Park, for example, offers back-country sites found along hiking trails as well as designated campgrounds suitable for small campers and tents. Sebago Lake State Park has one of the largest lakeside campgrounds. It can handle the largest bus-sized RVs and still has spots tucked away for those wanting to rough it. Private RV campgrounds are found along the Acadia Coast, around the Portland area and in the interior. Some are resort-like in nature, having swimming pools, recreation centers, sundry stores and other services. Some private RV campgrounds also have a few spots for tent campers. Imagine staying in a restored red-brick townhouse dating back to the 1800s, located in the heart of downtown Portland. Your room has the creature comforts of the modern age, but the furnishings and decadent high ceilings of an earlier era. Perhaps you’d prefer a cozy farmhouse on five acres of open space tucked away along Maine’s mid-coast, or a hillside estate overlooking Moosehead Lake. If you are searching for best safaris in East Africa, Kenya’s leading tour operator African Sermon Safaris is now offering Tanzania tours at lower prices! Visit this site for the best holiday experience ever: http://africansermonsafaris.com/category/tanzania-safaris/ to learn more.